Today is such a tempestuous day: thunder is following on immediately after lightning so the flashes are hitting very closely indeed. It’s a risk even to type these words on the computer as several friends’ techy stuff has been damaged by these phenomena – how awful to loose one’s data and, especially, one’s photographs! 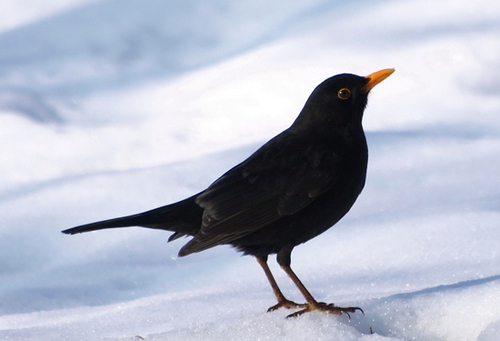 Freezing rain is now turning into sleet and perhaps snow – definitely not a day to wander out! It is, however, a day to reminisce about past summers and happy times spent at the seaside. One of my favourite places is Tellaro which I first visited in the August of 2006. It’s wonderful to find such a relatively unspoilt fishing village in an otherwise touristy area. The village’s little church is delightful and is so near the sea that it almost seems to float on the waves. Anyone who has followed the lives of those two great literary brits, Lawrence and Shelley will recognize the place as the one they stayed at. Tellaro’s street signs remind one of these facts. But it’s, of course, not just these two that fell in love with Tellaro and nearby Fiascherino: one of Italy’s greatest modern writers, Mario Soldati, stayed here and painters were and remain legion. Tellaro is also listed as one of the “borghi più belli d’Italia” (the loveliest villages in Italy). Our own Mediavalle-Garfagnana area contains three of these “borghi più belli”. They are Coreglia Antelminelli, Barga and Castiglione di Garfagnana. This is the complete list for Tuscany. The ones with asterisks are the ones we visited (Montemerano, Suvereto, Porto Ercole just last year). Of course, such lists are a trifle subjective but if one is pressed for time there’s absolutely no reason to doubt that these are some of the prettiest places in Tuscany, if not in Italy. Looking at photographs of the past is both delightful and painful. Sometimes more painful, clearly, when loved persons and animals are no longer with us. However, on this meteorologically utterly miserable day there can be no greater delight than to gaze on pictures showing blue seas and sunny days and realise that new joys can still arrive if we have the patience to wait for them. Perhaps this summer we’ll add a few more “borghi più belli d’Italia” on our list! 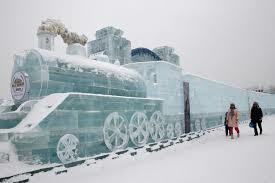 Ice sculptures are becoming increasingly popular forms of art, especially in the colder parts of the world. Harbin, in Manchuria, for example has a very well-known international annual ice and snow sculpture festival. I’ve never actually been there but, gazing at pictures of some of the exhibits, it looks spectacular! Ice festivals have spread in many other parts of the world and, since 2009 there’s even been an ice sculpture festival held at London’s Canary wharf. In Italy, Christmas cribs provide some nicely traditional forms of the art. 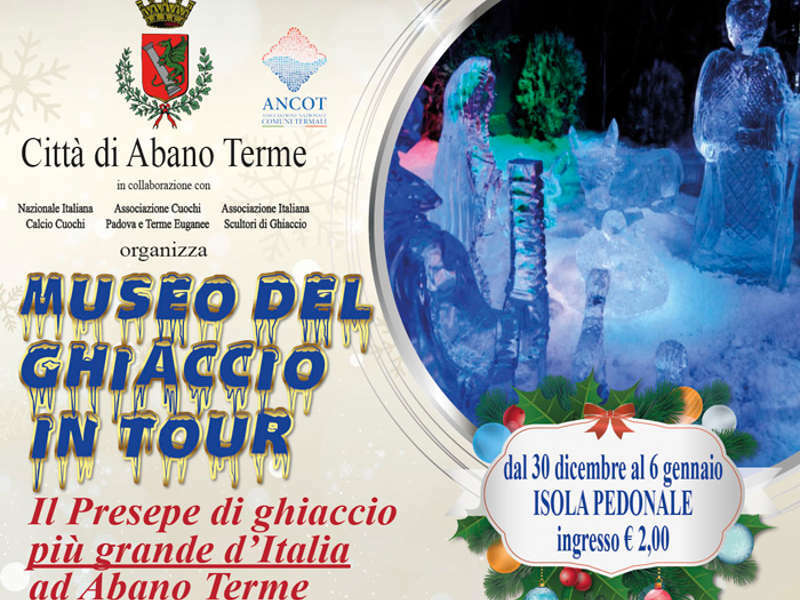 There’s a particularly good festival at Abano terme near Padova in the Veneto which I must make a date to visit next Christmas. Of course, like sand sculpture, ice carving is a “temporary” art and, as such, indicates an almost Zen-like reflection on the transience of life and artistic creation. Tibetan mandalas, and Navaho sand paintings which must be destroyed immediately after completion, come to mind in this respect. 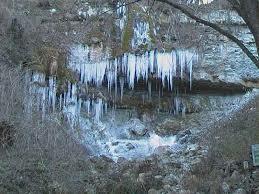 If one believed in the permanence of great works of art then one shouldn’t become an ice sculptor! Great skill is needed to become an effective ice sculptor since the material used changes constantly according to temperature and water purity. Ice sculpture can be of two main types: in the first, one works on the ice itself with special chisels and saws, in the second, one controls water coming from a hose in intricate patterns to form amazing textures. Every winter at Longoio, when sub-zero temperatures persist at night there is a spectacular sight created by a marriage between nature and man. 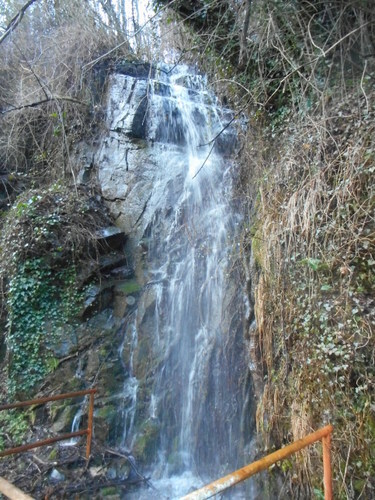 A local hose pipe weaves its way down from a precipitous waterfall near my house and, at one very leaky stage, creates remarkable effects. I passed by the holey part of the hose yesterday during an utterly clear and beautiful day when I went for a walk with two of my cats. Only nature’s art could create such wonderful interlacing and delicate effects. It was quite stunning especially when its background was made up by the snowy peaks of the Apuan Alps. Our cats thoroughly enjoyed their walk, as usual, and refreshed themselves amply at the fountain on the outside wall of our house. Cowbells for the great Austrian composer and lover of nature, Gustav Mahler, evoked a feeling of pastoral innocence and nostalgia for the passing away of child-like feelings of immortality. Mahler said that cowbells were the last sound to be heard from the earth by the lonely in the highest of heights and that they were a symbol of total loneliness. Certainly this is the feeling evoked in his greatest slow movement from the Sixth symphony where cowbells sound particularly poignantly. (the Seventh too…). For me there is a big difference between being alone and being lonely. 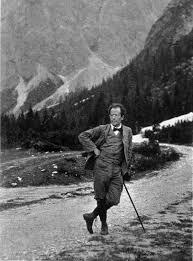 I think Mahler believed in aloneness (rather than loneliness) in typical Garboesque spirit. He even sometimes complained when there were too many birds singing around his isolated composition hut in the Austrian Alps. One is truly summoned by bells where I live. From the church chimes ringing across the valley from the Pieve di Controni to the sound of sheep bells they are a particular feature. 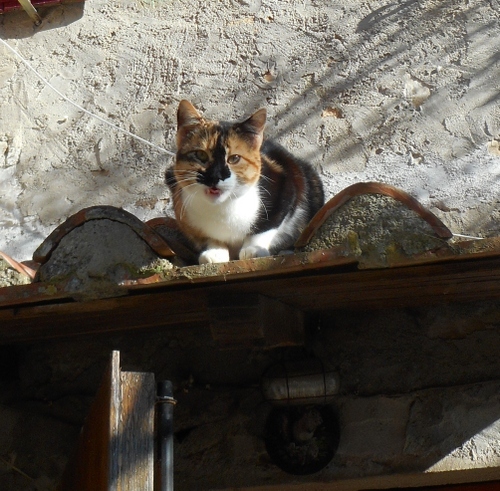 When I and my cats returned from our walk yesterday some bells seemed very close to home. I looked out and saw a herd of fine sheep coming up our little road escorted by two dogs and a rosy-cheeked shepherd girl. Soon I was surrounded by the finely horned animals, some of whom started trying to chew at my sweater! Recently I received an email from down under hoping that when the sender arrived here there would still be some snow left. Actually, little snow has arrived so far this winter but things are due for a big change this Thursday when considerable falls are predicted. Some of the white stuff seems already to have arrived, anyway. Yesterday I went on another familiar circular journey which takes one up to the village of Granaiola, through Monti di Villa to the little chapel of Santa Anna and thence down to Vetteglia and back to Longoio. Granaiola, so called because it’s been a major wheat (grano) basket for our area, was last Christmas’s living crib site. It’s also the birthplace of Nicolao Dorati, an important renaissance composer who lived from 1513 to 1593. Although renowned as a trombone player, Dorati’s output consists entirely of madrigals and no instrumental music at all. Nicolao published six sets of madrigals: for five voices in 1549, 1561 and 1567; for five to eight voices in 1551 and for four voices in 1570 and for six voices in 1579. In 2012, in conjunction with Bagni di Lucca’s Michel de Montaigne foundation which organises cultural events, a concert was held in Granaiola’s church where star local organist Enrico Barsanti played arrangements of Dorati’s vocal work. There’s a plaque commemorating Dorati at the start of the main village street on his birthhouse (not open to the public and somewhat unstylisticaly rendered in cement)..
To this day I’ve not been able to hear any of Dorati’s madrigals live. Perhaps there’s a chance there for Lucca cathedral’s Capella Cecilia to have a try and, maybe issue a recording of this not –very-well-known composer. The route towards Santa Anna chapel provides extensive panoramas of both the Apuan Mountains with its “Queen” peak, Pania Della Croce, and the Apennines with its triangular Monte Rondinaio, both amply clothed with the white stuff. 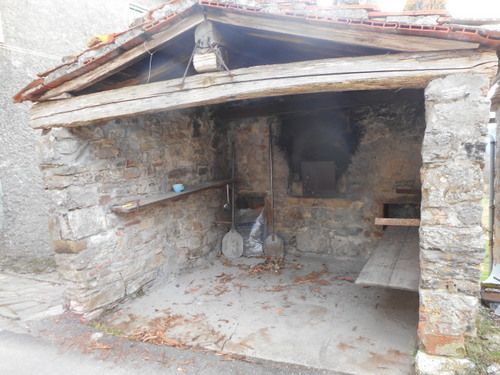 Descending into San Cassiano, settled snuggly into the slopes of the Prato Fiorito, I stopped at one of this spread out village’s “frazioni” (literally fractions or parts) Cembroni where I was happily informed that the following oven is still in use. Reaching home I checked out to see that wood and food supplies were ample enough to see me through the delayed winter arrival. 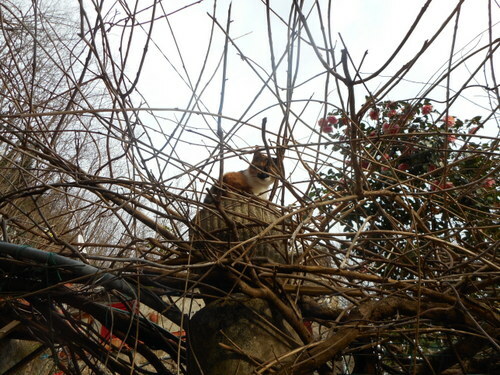 Certainly one of our cats seemed to think it was. Colognora Valleriana in the comune of Villa Basilica (not to be confused with Colognora di Pescaglia, famous for its chestnut museum, Catalani’s birthplace and the setting of Spike Lee’s film “Miracle at St Anna” or even Colognora di Compito near the Pisan Mount), is the next village after Boveglio on the way down from the Passo del Trebbio to Collodi. I’ve already said something about Boveglio at https://longoio2.wordpress.com/2015/01/22/visiting-in-the-rain/ so now let’s talk about this lesser known Colognora. The name clearly derives from Latin “colonia” and it’s one of the many villages in our area founded by Roman legionaries returning from their spell of duty and being given land to retire on by the Empire. .Spread out on a narrow and steep mountain spur Colognora is yet another one of these fortified villages like Boveglio and is built around a castle which now is no longer clearly distinguishable except for some massive entrance arches..
Colognora is definitely worth a stop and a stroll around its streets reveals some fine domestic architecture and some delightful corners. When I first visited Colognora I heard some lovely piano music and was told that a young person in Colognora was practising hard to become a concert pianist. I wonder if their dream came true. On January 25th 1759 Robert “Rabbie” Burns”, recently re-voted by his own people as the greatest Scot of them all, was born. Every year since his death there has been a special Burns evening to commemorate this extraordinary poet who not only was a precursor of the Romantic Movement but was also a figurehead for Scottish nationalism and a pioneer socialist to boot. Late yesterday afternoon it dawned upon me that this was indeed Burns’ birthday. Although neither of us are Scots (although my dad’s mum came from Wales so there is a good quarter of Celtic blood in me somewhere) we love things Scottish, delight in its country, walked its moors, climbed its mountains, navigated its lochs and have celebrated its Burns night in our own little way. I looked in the fridge to see if there was anything I could dig up to make a Burns supper. There wasn’t very much there at all and it was getting too dark to even go hunting for a haggis. What misery! However, there was still a chance that something might be rustled up. On Sunday evening the only shop that’s open for miles around here in Bagni di Lucca is the Penny Market at Borgo a Mozzano. What would I be able to find there? 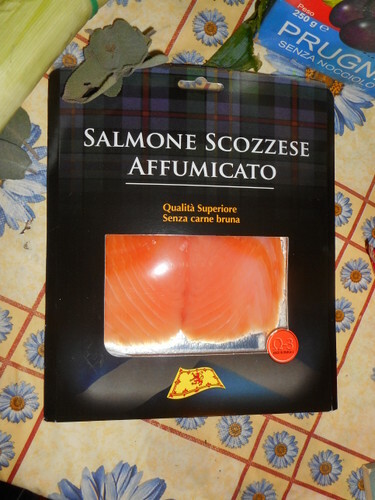 After my supermarket shop I did find two products that were genuinely from Scotland: salmon and whisky. Other items I bought because I thought I could make up an ersatz equivalent. In true Italian style I started off with an antipasto. 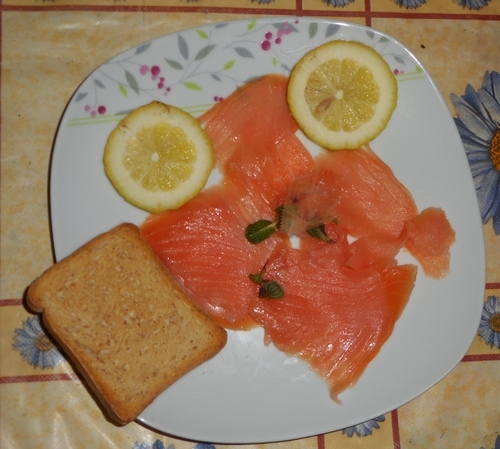 This was Scottish salmon served with a sprig of thyme and a squeeze of lemon which wonderfully turned out to be one from our very own lemon tree which, despite being under wraps to protect it from winter frosts, still manages to produce the most delicious fruits. Defrost the quails and fry them gently until lightly brown. In a large saucepan put in the quails, water, onion and pearl barley. Cook until boiling. Then lower the flame and simmer for one hour. 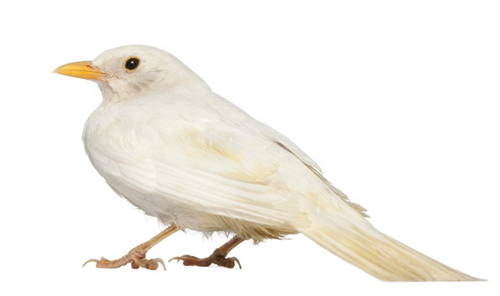 Remove the quails from the soup and debone them. Cut the quail meat into little pieces and replace in the saucepan. Add the leeks, celery, thyme, parsley, salt and pepper. Boil and simmer for another half-an-hour until the leeks are nicely tender. 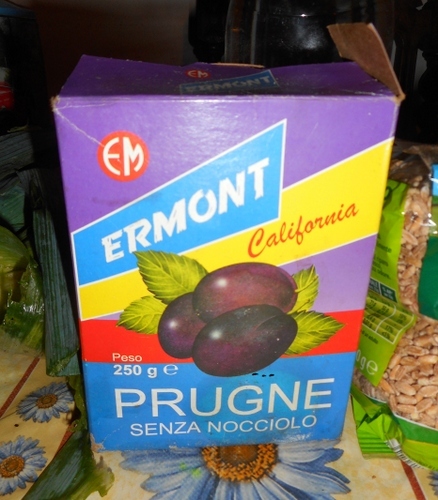 PS The addition of prunes is also advised by some cooks. 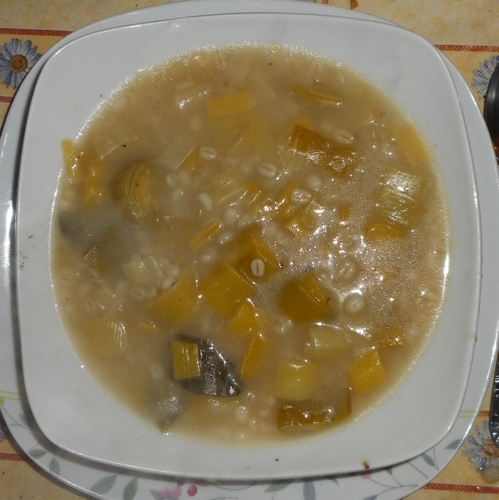 50 gms spelt (local grain) (instead of oatmeal which I didn’t have. Defrost the mincemeat and then fry gently in a frying pan until grey. In a saucepan place the mincemeat with the spelt, onions, rosemary, meat stock and salt and bring to the boil. Then simmer for around an hour. In the event of not finding sausage tubes drain off the saucepan and compact the remaining mixture into a pudding-like shape. The classic Burns night sweet is, of course, the cranachan which is made up of oats, cream, whiskey, honey and raspberries. 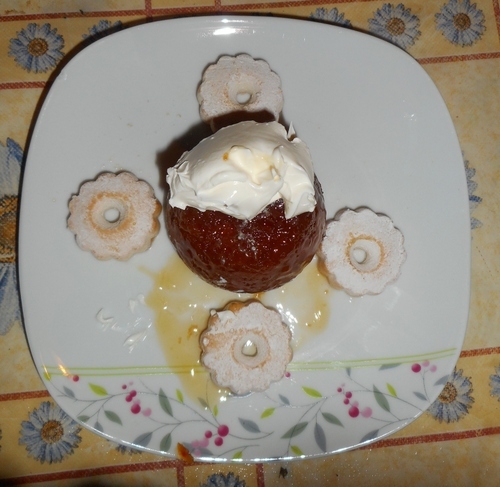 I opted for my own creation which owes a little to the clootie pudding. Serve on plate with dollop of mascarpone cheese on top and surround with four canestrelli biscuits. No pipers were available so the haggis was flageollated to the table using one of my tin whistles (or flageolet). I didn’t include tatties (potatoes) and neeps (Swedish turnips or swedes) with the haggis as after all that soup and the haggis my stomach was getting a little bloated. But these, traditionally, should be included. Of course, the whisky has to be chosen with care. Instead of the usual 5 euro bottle of the water of life I upgraded to the 7 euro one which was guaranteed to have been aged for not less than five years. It really was very good and had a nice smoke-peaty taste in which I detected parts of the landscape of Islay (or was I slightly inebriated at this stage?). 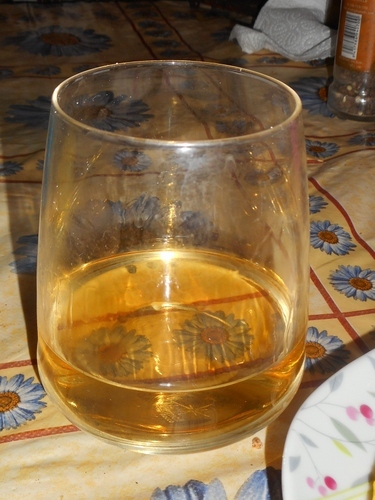 I didn’t add soda to the whisky but, instead, found that a bottle of fizzy gassosa went very well with it. Naturally, Burn’s famous address to Haggis was also read. In case you forgot it or your Scottish was a little rusty here is the first verse together with an explanation of some of the words. Ah well, at least it was a try in this remote Apennine village. Next year I’m promised an invite to a real Burns night supper prepared by a genuine Scottish lady. Looking forwards to that!